The Wetland Conservation Society was formed in 1985 following the high profile campaign to protect the North Lake wetlands from the construction of Farrington Road in September 1984. Initially the WCS focussed on protection of the Beeliar Wetlands that are faced with ongoing threats. This campaign lead to the establishment of the Beeliar Regional Park in the Cities of Melville and Cockburn, and Town of Kwinana. 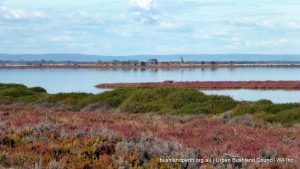 The WCS has now extended its campaign interests to wetland conservation throughout the metropolitan area and Western Australia as a whole and regularly makes submissions to development proposals and policy documents related to wetlands throughout WA. In addition to this the WCS is represented on a variety of government and public committees involved with environmental issues. For the past 7 years the Wetlands Conservation Society has celebrated World Wetlands Day on February 2nd by working with the Cockburn Wetlands Centre to organise the Wetlands management Conference. The conference is attended by over 150 people a year and aims to provide an affordable forum for community members and local government to exchange information on the latest management practises and provides a valuable and much appreciated opportunity for networking. Becoming part of WA’s dedicated wetland conservation group is very easy. Come and join us and help protect our precious wetlands in Western Australia. You can join as an individual or a family and will receive regular newsletters to keep you up to date with issues and activities. The membership form is attached and should be forwarded to the address at the bottom of the page. Every Spring we head out to explore wetlands, bushland and wildlife of special interest to the group. We’ve admired the picturesque Ellis Brook Reserve, examined the amazing biodiversity of the Anstey Keanes wetlands and ventured onto the usually out of bounds, Garden Island. Many of the members are also involved in Community Planting days as part of the landcare program for Bibra Lake, North Lake and South Lake. So if getting down and dirty is your thing, this may be for you. Everyone is welcome to attend our monthly meetings, held on the third Wednesday of the month, from January through to November. The meetings begin at 8pm, at the Cockburn Wetlands Centre, 184 Hope Road, Bibra Lake. 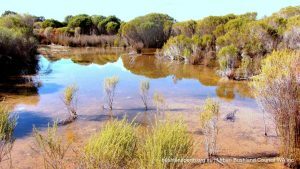 At the meetings we discuss updates of current issues and policy affecting Western Australian wetlands, and report on matters of interest to individual members. If meetings aren’t your thing don’t let that put you off joining the WCS, you can keep in the loop with the newsletter and join in community activities. Philip Jennings, 14 Stone Court, Kardinya WA 6163.